There is a pervasive belief amongst Japanese leaders and decision-makers that climate change will not have a big impact on Japan in the future. They are wrong. That is one reason many were dismayed when a May 2009 report found that, if no action is taken now, the economic costs of climate change to Japan could be as high as ¥17 trillion (US$176 billion) annually by the end of the century. The result of a four-year collaboration between 14 research institutions led by Prof. Nobuo Mimura, Director of the Institute for Global Change Adaptation Science at Ibaraki University, the Global Warming: Impact on Japan report (in Japanese only) was funded by the Japan Ministry of Environment. At a recent ground-breaking United Nations University symposium on the role of higher education in adapting to climate change, Prof. Kazuhiko Takeuchi, UNU Vice Rector, sat down with keynote speaker Prof. Mimura and asked him about the findings (see the video brief). cause increased deaths from heat stroke and communicable diseases. In a country like Japan whose geography, topography and climate means it has always been prone to serious natural disasters (especially seismic activity and typhoons), people are likely to react with resilience and calm to additional impacts from a changing climate. Japan is renowned for the high level of expertise and technology it has developed to monitor, prepare for and respond to floods and earthquakes, such that many other countries seek to follow its models [see the OECD’s Review on Japan’s Risk Management Policies: Large-scale floods and earthquakes (full text by subscription)]. However, Japan has entered a challenging new era in which the ageing of its population will result in population decline of one third within 50 years. The country also has serious food security challenges. Highly dependent on foreign imports, only 40 % of Japan’s food is produced domestically, putting its food production self-sufficiency rate as lowest in the developed world. Compounding this problem, flood-prone urban areas are becoming more densely populated since the rural ecosystems that have protected them have become under-managed as farming communities decline. Add in the very serious challenge and considerable risks posed by climate change, and the picture of Japan’s future will be unclear and infinitely complex. Climate change is already having an impact on Japan, according to a 2008 report by the Japan Committee on Climate Change Impacts and Adaptation Research, entitled Wise Adaptation to Climate Change (another project chaired by Prof. Mimura and commissioned by the Ministry of Environment). Rice yields and quality have been steadily declining due to higher temperatures. Shorter ripening periods and increased pest damage have shrunk harvests of soybean crops. 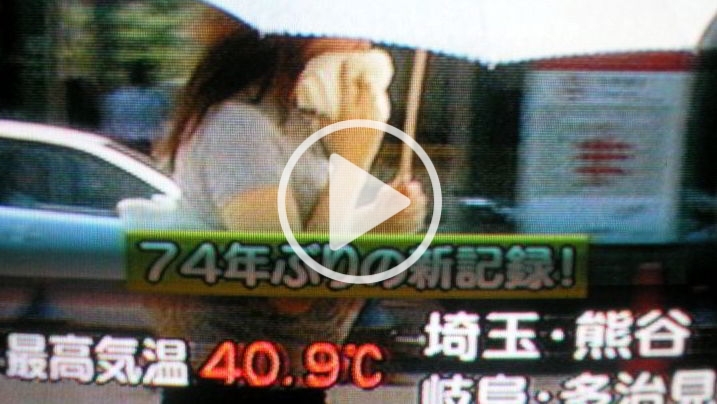 And in summer 2007, record temperatures of up to 40.9 degrees Celsius were tracked for the cities of Kumagaya and Tajimi-the highest temperature on record for Japan. Looking to the future, the May report presents a series of equally grim impacts. 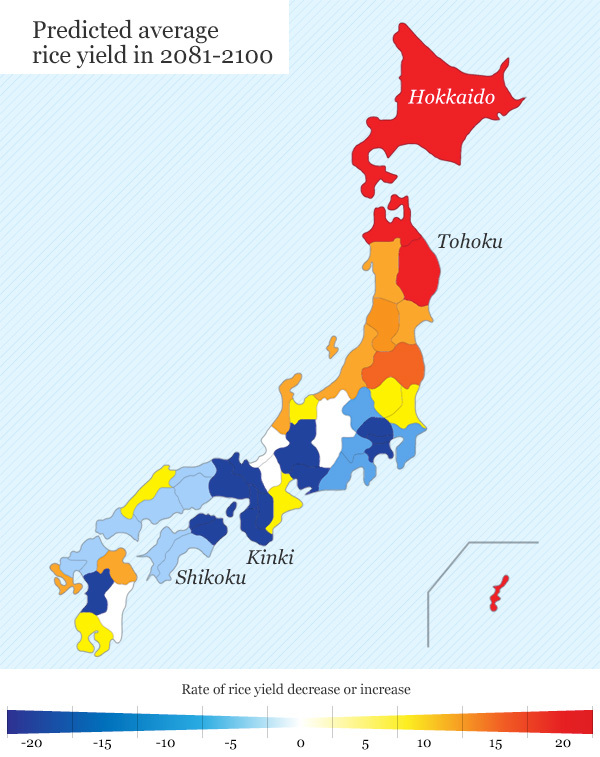 For instance, by around 2050, rice yields in the Kinki and Shikoku regions may decrease by 5%, whereas the yield in northern Japan (Hokkaido and Tohoku) could increase by up to 26% (see map). Nationwide, the areas suitable for beech forests could decline 30-56% between 2031 and 2050. In the coastal zone, an estimated 1.3 million people could be vulnerable to storm surge flooding, especially in western Japan. In terms of human health, it is predicted that the number of people at low risk of death from heat stress could double by 2100, and those at high risk may increase fivefold. How Japan will adapt to minimize the negative risks, while taking full opportunity of the positive effects (such as increased rice yields), will be a critical question over the coming years. Prof. Mimura remains optimistic and argues that “we need to revitalize local communities while creating safe and resilient communities at the same time”. These challenges could work to energize Japanese society to make changes in many areas, including designing compact cities, rejuvenating agricultural systems, and creating local communities that co-exist in harmony with nature (see our Satoyama video brief). In the interview, Professor Takeuchi was keen to highlight the fact that Japanese expertise and knowledge in adapting to climate change could also be very useful for other countries, especially developing countries. While agreeing, Prof. Mimura pointed out that, since circumstances vary, each country should share their knowledge, but also think very carefully about how they will be affected by climate change and what they can do. According to the Wise Adaptation Report, there will be no single way to adapt, especially given that climate change affects different areas in different ways. Strategies should include a whole suite of options-from ‘hard’ infrastructure measures (e.g., flood embankments) to ‘soft’ options like growing more drought-resistant species that require less water and fertilizer, legal and policy tools that guide land-use, and hazard maps to facilitate evacuation during natural disasters. However, because resources are limited, and given the current global financial crisis, adaptation should be considered as part-and-parcel of other national priorities and well-established programmes. Referred to as “mainstreaming”, when this occurs, adaptation simply becomes an extension of sustainable development practices. It is interesting to note that the United States has just published its own report on the climate change impacts it is experiencing and will experience, as well as the adaptation options. The report was prepared by experts on behalf of the US Global Change Research Programme, which includes 13 government departments and agencies. And, not by coincidence, its key findings are very similar to those of Japan’s May 2009 report. The climate-related changes are already observed in the US and its coastal waters range from declines in mountain snowpack in Alaska and Western States, to sea-level rises and storm surges increasing risk of erosion and flooding in many coastal areas, especially along the Atlantic and Gulf Coasts. Health impacts predicted in the report also include heat stress, waterborne diseases, poor air quality and extreme weather events, as well as diseases transmitted by insects and rodents. While robust public health infrastructure can reduce the potential for negative impacts, the report does not put an economic cost to these predictions. This is something we will need to wait for. In the meantime, we will also have to wait for more countries to undertake similar studies, so that we can begin to put together the full jigsaw puzzle that is climate change. The world is in a race against time as we seek to improve our understanding of climate change impacts and respond effectively to them. So far we only a few comprehensive country reports that have begun assessing the impacts and economic costs of climate change — mostly from developed countries. Two examples are the pre-eminent Stern Report, and also Australia’s recent Gaurnat Review, released in September 2008. But what about adaptation? According to the OECD, even the developed world is not taking as many proactive steps towards planning for and implementing adaptation measures as it could be. The Europeans, who are usually “green frontrunners”, are behind on adaptation according to a new report published this month, Europe Adapts to Climate Change — Comparing National Adaptation Strategies. Lack of funding is often given as the main reason why the global community is failing to invest in adaptation. The challenge is that adaptation is often overshadowed by discussions on mitigation measures such as carbon reduction targets, and thought of as a developing country issue. But no longer can adaptation be seen as the poor cousin to mitigation. If we focus all efforts on how to stop our emissions tomorrow, we fail to recognize that yesterday’s emissions are already having an impact today, to which we must adapt. At the same time, successful climate change adaptation requires good climate change mitigation. Like in the Greek myth of Sisyphus, climate change is the true challenge of our time. As punishment, Sisyphus was made to roll a huge rock up a steep hill. But before reaching the top of the hill, the rock would always roll back down again, forcing him to begin again. Successful adaptation depends on effective mitigation strategies. Without mitigation, like the rock, the speed of climate change will increase and fall on us harder than predicted. Japan to Suffer Huge Climate Costs by Alva Lim is licensed under a Creative Commons Attribution-NonCommercial-ShareAlike 3.0 Unported License. Alva Lim is a former researcher for the Global Change and Sustainability Programme at the UNU’s Institute for Sustainability and Peace (ISP). Prior to that she worked for the Australian Government as an economic policy analyst at the Australian Treasury. As an accidental analyst-now-climate activist, Alva dedicates her time on issues about climate change adaptation and society, ethics and real world economics. She holds a Masters degree in Public Policy from the National Graduate Institute for Policy Studies (GRIPS), Japan and an Economics (Honours) degree from the University of Sydney, Australia.